What are the main deep bite causes? An overbite is the overlap of the top teeth over the bottom ones. In orthodontics, an overbite is measured by the amount that the teeth overlap in the vertical or the amount that the upper teeth cover the lower. An ‘overbite’ is normal and everybody has one. However when the overbite is too big or too small there can be problems. One such problem is when the overbite is pronounced, resulting in what dentists call a ‘deep bite’. A deep bite can cause problems including excessive wear, pain or aesthetic concerns. When an overbite is severe, orthodontists call this a ‘Class II’ – sometimes also called a retrognathic bite. An overbite or deep bite is different from an overjet and you can read about that in our article here: Overjet. To learn more about braces treatment or to have our orthodontist fix a deep overbite then follow the link here to our main braces page. A normal overbite is between 2-4mm. This is the normal range in which the upper and lower teeth appear aesthetic.. When an overbite is smaller, this results in a lot of the lower teeth being on show. When there is a very much reduced overbite or no overbite, this is sometimes called an anterior open bite, which is where there is a gap between the upper and lower teeth when the jaws are closed together. Patients often perceive this to be less aesthetic than the ideal. If the overbite is increased, less of the lower teeth are on show. In more severe cases this can result in wear of the lower teeth against the upper or trauma of the gums on the back of the upper central incisors. 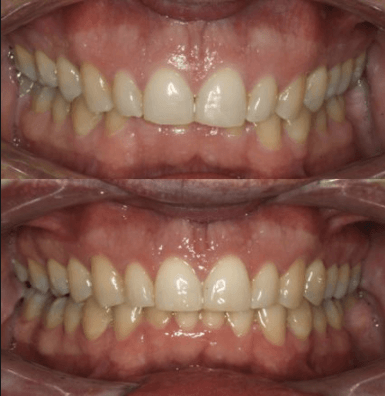 Correcting a deficient or exaggerated overbite is key to braces treatment. If the overbite is reduced then the orthodontic result may not be as stable or attractive. 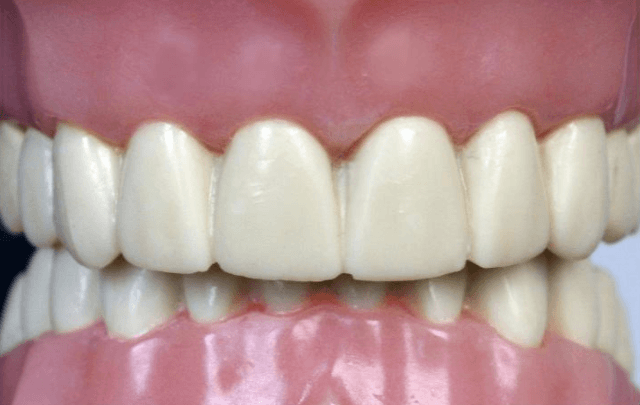 If the overbite is increased, it may restrict the alignment of the teeth and orthodontic treatment may not be as successful. The overbite is one of the first things to be corrected in braces treatment. Overbites are mostly inherited. This means that if mum or dad has a very deep overbite their child will have that trait also. Thumb sucking can also influence the degree of overbite often resulting in deep bites. If the teeth protrude significantly, this can also increase the amount of coverage of upper over lower teeth, again resulting in a deep overbite. An increased overbite can result in the lower teeth being covered by the upper teeth. This can make the upper teeth appear too prominent or long. Often it can give the appearance of the chin or lower face being shorter and disproportionate to the upper face. The underlying cause of a deep overbite is often a shortened lower face height. This is where the lower part of the face does not grow in line with the upper teeth and the result is often a more horizontal mandible (lower jaw) and a smaller lower face. This can result in an aged appearance, a crease above the chin and sometimes a protruding chin. An increased overbite which also increases the amount that the upper teeth protrude carries additional problems. It can result in the risk of trauma increasing many times over – a particular problem in children. It makes sense that teeth that stick out can be easily damaged. Increased overbites can also result in trauma of the palate due to the lower teeth hitting this surface if the overbite is very deep. A deep overbite can also result in the premature wear of the teeth at the front, resulting in shorter lower front teeth or worn surfaces on the inside of the upper from teeth. Overbite speech problems can be caused if the overbite is extremely deep and this is something that can be addressed in child or adult overbite treatment. 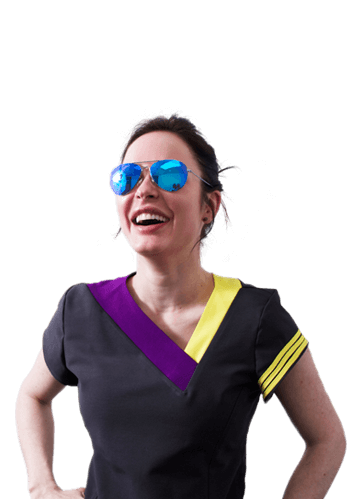 Overbite correction is one of the first things to be addressed in orthodontic treatment and braces for overbite correction are available here at Smileworks. Often, deep overbites can be corrected as part of orthodontic treatment. In severe cases the patient may require surgery to correct both the jaw relationships and the teeth together. Overbite correction surgery is something patents would need to be referred for. Deep overbites are best addressed when the patient is still growing. They can also be addressed in adult orthodontic treatment and fixing an overbite in adults is something we do a great deal at Smileworks. To learn more about how to treat a deep bite or pronounced overbite with braces or adult orthodontic treatment call Smileworks on 0151 236 5166 or take a look at our main orthodontics page.